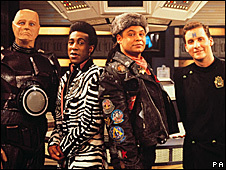 Cult comedy Red Dwarf is returning to TV, 21 years after its initial launch. BBC News pulls on a giant space helmet and goes behind the scenes at Shepperton Studios. Warning: may contain minor plot spoilers. We're three million years in the future, and Dave Lister - the last man in the universe - is eating tomatoes and sneezing all over his ironing. Welcome back to the sleeping quarters of the mining ship Red Dwarf, which have been lavishly recreated for three new episodes of the hit comedy show that ran on BBC Two between 1988 and 1999. The show has been resurrected by digital channel Dave for the Easter weekend. Written and directed by Red Dwarf co-creator Doug Naylor, the new storyline reunites the classic cast, including Coronation Street's Craig Charles. "This is the costume from 1992," says Charles - who plays space slob Dave Lister - during a break in filming. "It still fits, I'm really chuffed." "It's a great feeling. You put on the boots and the leather trousers - and you start to get the Lister walk. Then the leather jacket and the dreadlocks go on and suddenly you're Dave Lister again." I walk up those cobbles five days a week and all of a sudden I'm walking up dressed in leather with a robot! The new story Back to Earth sees the Red Dwarf crew - Lister, Rimmer, Cat and Kryten - nine years older, and interrupted by the discovery of a dimension-hopping leviathan in the ship's water tank. "The banter's still the same. It's like we never went away," says Charles, who was given special leave from Coronation Street for the February shoot. "This plot is amazing. It's more of a comedy-drama than a sitcom. "On Lister's part it's much more emotional. He cries his eyes out in this. I think it's going to surprise a lot of people, the emotional maturity of the piece." 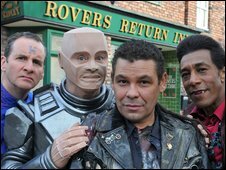 It has already been revealed that, in a surreal plot twist, the Red Dwarf crew find themselves on Coronation Street. "It was very strange seeing my new friends and my old friends together in the same location. I walk up those cobbles five days a week and all of a sudden I'm walking up dressed in leather with a robot!" laughs Charles. It can get quite mind-melting, especially when you're 300 degrees and your head's covered in rubber! That "robot" is Kryten, the square-headed mechanoid played by Robert Llewellyn. Lewellyn admits he's enjoying the astronomical leap in technology since the old days of Red Dwarf. "We're using Red cameras and they're the latest bit of super high definition technology. So it looks like proper film," he enthuses before heading into make-up. "The scenes that are hard to get your head round are when you're in front of a green screen and you're meant to be next to a 70,000 tonne space ship, or in a corridor that's four miles long. "It can get quite mind-melting, especially when you're 300 degrees and your head's covered in rubber!" Llewellyn has been keeping Red Dwarf fans up to date during filming via his Twitter feed. "I have so many questions that I just can't answer," he says. "There's a couple of people on the set who are following me as well, so I'm being very discreet. And also I don't want to spoil the show." This isn't the first time the Red Dwarf team have been working on a new story in the 21st Century. A big screen outing nearly got off the ground in 2004 but ultimately failed to launch. Danny John-Jules, who plays fashion-obsessed Cat, recalls: "Several times we'd be sitting round doing script readings. There were production meetings at one point." 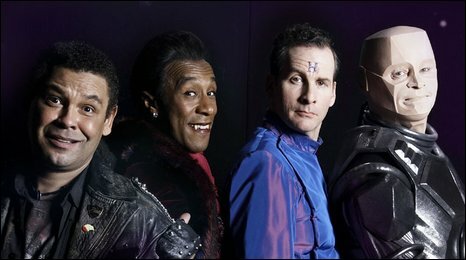 So what's been the reaction of Red Dwarf fans to the resurrected TV show? "It's been fandemonium," says John-Jules, who's as cool and laid-back in real life as he is on screen. "We'd always been answering that question - when is Red Dwarf coming back? You don't have to be a Bachelor of Science to work out that if you've got a few million people asking the same question then you should do something about it." And what's in the Cat's wardrobe this Easter? "I'm in lilac and burgundies and all kinds of bling. One of my costumes is inspired by Mama Mia and the other by Strictly Come Dancing!" Chris Barrie is back as Arnold Rimmer, the uptight hologram with an H on his forehead. But now he has to contend with a rival called Katerina (played by Sophie Winkleman). "She's a sort of nemesis figure for Rimmer," says Barrie. "I don't think I've ever had to perform in a not-get-on kind of way with someone so gorgeous in my life." It's two weeks after all the location filming is complete and Barrie is still fizzing with enthusiasm. "The stakes are high - it's 10 years since we were last on screen, the 21st anniversary of the start - I'm a little bit biased, but I think this could be some of the best Red Dwarf we've ever made." But does Barrie think there's more Red Dwarf to come? Whether we will ever again see them lying shipwrecked and comatose (drinking fresh mango juice with goldfish shoals nibbling at their toes) will depend heavily on how the new episodes are received. But watching the actors rehearse on the vast Shepperton set, it's remarkable how none of them seem to have aged since they were last on screen. Can it be that time is going backwards? It's just like a classic Red Dwarf plotline. Back To Earth - Part One is on Dave on Good Friday, 10 April 2100 BST.